Rated 3.9 out of 5 stars.10 total votes. Small and subtle design techniques can create a fantastic overall design, much like the slow tapered effect that the base of the tabletop on this Dining Table has. The unique oval shape of this Dining Table is mimicked in the oval pedestal base. A warm wenge veneer finish covers both the tabletop and the base of the table to create a unified composition that primarily puts focus on the interesting design of this Dining Table. At Corrigan Studio, they believe that mid-century modern design should be functional and beautiful. Their collection of iconic furniture includes items for every room, from the lounge to the office. Seamless silhouettes in chic materials bring authenticity, while rugs in abstract prints and geometric patterns are designed to tie your look together. When you buy a Corrigan Studio Wallace Dining Table online from Wayfair, we make it as easy as possible for you to find out when your product will be delivered. Read customer reviews and common Questions and Answers for Corrigan Studio Part #: CSTD5712 on this page. If you have any questions about your purchase or any other product for sale, our customer service representatives are available to help. Whether you just want to buy a Corrigan Studio Wallace Dining Table or shop for your entire home, Wayfair has a zillion things home. Great table ! I am an interior designer in LA ( Modiano design ) and ordered this for a project in Texas. The table is great, looks good. The only thing that it was a little damaged on top. DO NOT ORDER THIS TABLE! You will never be able to assemble it. Whoever boxes this table cant read and doesn't know how to put the correct screws in the box. It calls for a 2ft 3 in rod and it's a specialized rod and I cant get it delivery to me for nothing! Rod on back order but table was in stock so it was sent out to me and again still no 26in. rods in the box so they cant assemble it, I'm sick of this! This table is gorgeous and has such a unique sculptural shape. It arrived when it was supposed to and the white glove delivery was worth every dollar. The table is beautiful the only negative point is that need to use something to balance it, but I love it! very modern and stylish. It's well made. Rated 4 out of 5 stars.44 total votes. This dining table is a beautiful work of art that embodies innovation and simplicity. This round table is designed for modern, elegant dining rooms. This item is deemed acceptable for both residential and nonresidential environments such as restaurants, hotels, lounges, offices and reception areas. Squares, circles, rectangles, ovals: What dining table shape best fits your needs? A round table cuts out the corners, creating a cozier, more intimate space where everyone can see everyone else at the table. Plus, it’s the perfect space-saver. Like this table, for instance: Seating three, this design’s round top and pedestal base makes the most of your square footage. 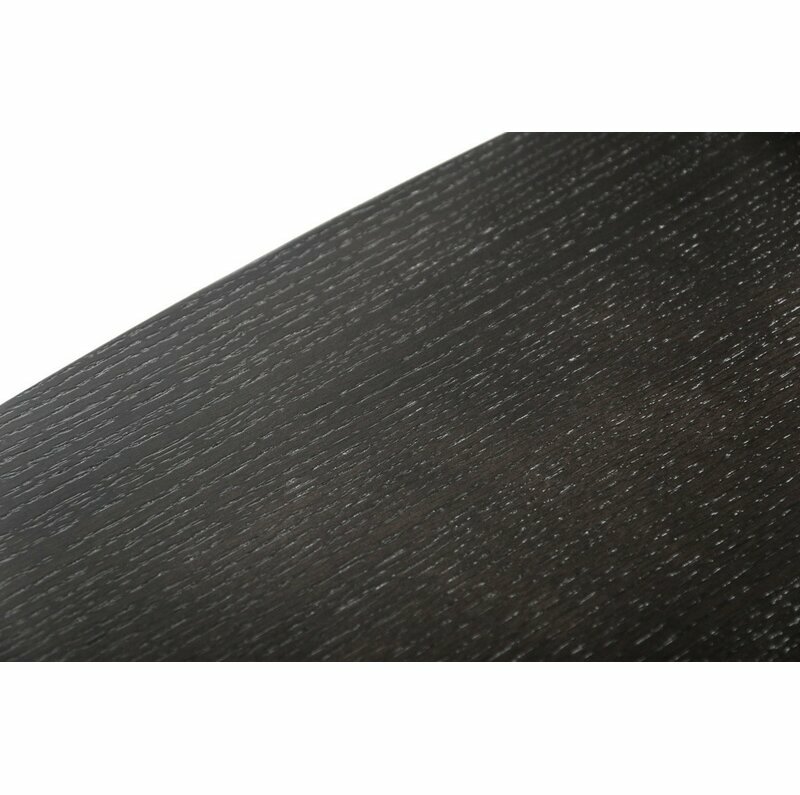 It’s crafted from manufactured wood with black oak veneers in a dark stain finish. What’s more, the base features ribbed details for added texture. Rated 4 out of 5 stars.45 total votes. No accent is guaranteed to grab glances quite like this dining table – just check out that silhouette! This mid-century modern design is crafted from solid and manufactured wood, striking a mushroom-like appearance. It’s finished with a high-gloss lacquer for a look that pairs futuristic with retro – all while resisting water marks and stains. It seats up to six comfortably. The right design can bring simple geometric shapes and create a masterpiece for your dining area. This table has those elements with its dramatic brushed brass finished stainless steel base and walnut veneered table top. This table is large enough to seat six comfortably. Rated 4 out of 5 stars.66 total votes. No accent is guaranteed to grab glances quite like this dining table – just check out that silhouette! This mid-century modern design is crafted from solid and manufactured wood, striking a mushroom-like appearance. It’s finished with a high-gloss lacquer for a look that pairs futuristic with retro – all while resisting water marks and stains. It seats up to four comfortably. Do you want a striking addition to your nook or dining area? This table brings that and more with a dramatic circular silver leatherette upholstered base and walnut veneered circular table top. This table is also large enough to seat four comfortably. Rated 4 out of 5 stars.162 total votes. Gather friends and family for Sunday brunch or a celebratory meal around this charming Dining Table, showcasing One leaf and a turned pedestal base. 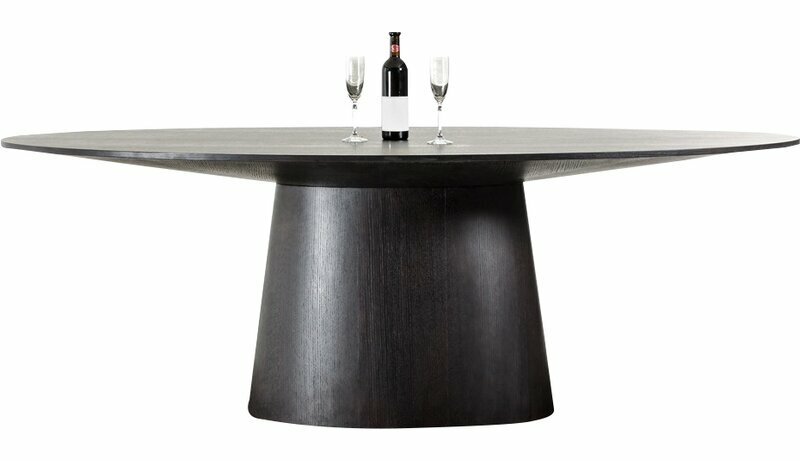 This Dining Table with a single base, which supports the round top. . The lovely combination of the colored top and the hollow transparent leg infuses elegance into the surrounding while bringing uniqueness to the structure. The top of the table comes in a vast range of colors both transparent and matte.